This episode, from page 254, illustrates one of the problems with the way my mind works: it automatically pictures everything that can be pictured. This helps with story creation, but it makes metaphors needlessly distracting, particularly when they don’t create a picture that makes sense. I was sitting in an auditorium-style classroom, in a comfortable padded chair. That was new. College classrooms didn’t have padded chairs in my day. Around me sat people of my same age and situation: the men with thinning hair and the occasional streak of silver; the women with short, discreetly dyed, practical styles. Specifically, about the need to stop. My imagination presented me with the image of a college student. He had longish hair and a bored expression, and he was walking across campus to class. Meanwhile, his two anxious parents hovered along after him. They hung in the air a few feet above and a few feet behind him, their helicopter blades gently humming. The image caught my fancy, and I smiled. I glanced around at the nearby faces to see if anyone else was smiling, but the other parents looked grave. As a group, we were soberly dressed, but with a few well-chosen bright touches—chunky silver jewelry, perhaps, or a kelly-green cardigan over a linen shirt. I still know how to have fun! these touches said. I’m not old yet! But in fact, our definition of fun had changed considerably since our own college days, along with many other things about us. The close attention we were all paying to the lecture, for instance: that was something I didn’t remember from the old days. Roots? Wings? My imagination spun for a second or two. Then it coughed up an image of an eagle whose claws had grown into the ground. He was flapping his wings, trying to fly, but the root-claws wouldn’t let him. Roots and wings? That made for one very unhappy bird! But once again, as I glanced around, I found that no one else was smiling. The other parents were nodding solemnly. Text copyright 2015 by Clare B. Dunkle; text courtesy of Chronicle Books. 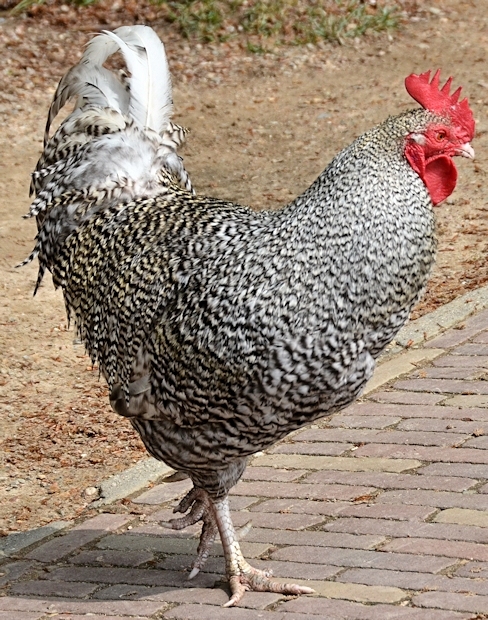 Photo of rooster with red eyes copyright 2014 by Joseph Dunkle. To read my latest blog posts, please click on the “Green and Pleasant Land” logo at the top of this page. The excerpt below, from page 252, relates part of an argument Elena and I had over how much she had eaten for dinner. We had arguments like these almost daily that year; by this time, Elena was eating nothing voluntarily. They caused real problems for my writing. Cue the expected rise in volume. I am stone. I am solid rock. I will not give an inch. The waves break over me, but they only push me further into the ground. I am not moving. I will not budge. At this point, Joe finally intervened. And Elena did it—not for me, but for her father. She ate standing, glaring at me, taking four or five swift, angry bites, and then dropped the second piece of pizza half eaten beside the first. “There!” she snapped, and she stormed out of the room. I don’t care, I thought as I listened to her clatter up the stairs. I don’t care that my heart’s pounding and my dinner’s ruined and I’ve got no help now with the kitchen. All that matters is that Elena has more food in her stomach. That’s the important thing. I made Elena eat. That’s what counts. It doesn’t matter how I did it. But later, when I tried to write, I was too worn out. Stepping into that fantasy world meant making myself feel sorrow, joy, excitement, fear—all the emotions my characters were feeling. But I couldn’t do that. I was too exhausted to feel. All I could do was worry. So Martin did nothing. He did absolutely nothing. He simply stood and stared at me while his computerized German shepherd shifted from foot to foot and let out anxious little whimpers. Do something! I told him. I’m here for you now. I need help. I need a distraction! Distract me! And perhaps it surprised my editor, but it did not surprise me when Martin embarked on a death-defying quest to rescue his mother. Text copyright 2015 by Clare B. Dunkle; text courtesy of Chronicle Books. 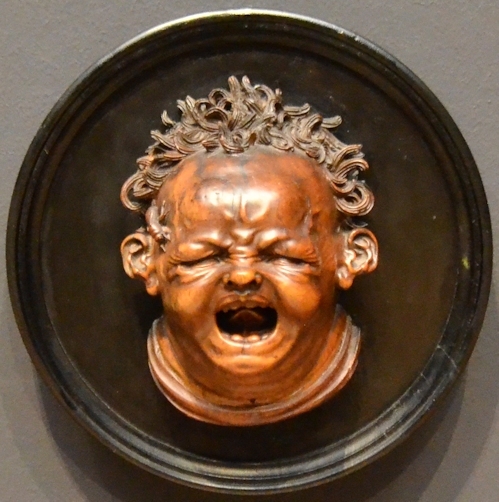 Photo of Screaming Baby (Cupid and the Bee) by Hendrick de Keyser, Rijksmuseum, Amsterdam, the Netherlands, copyright 2014 by Joseph Dunkle. To read my latest blog posts, please click on the “Green and Pleasant Land” logo at the top of this page. In the following excerpt, from page 245, Elena Vanishing comes up in conversation for the first time. This was in 2006, and Elena was a senior in high school. Right at the beginning, Elena asked me to help her write her memoir. But I hated the very thought of it. At the time, I was having problems of my own, and I was struggling to write anything at all. Several years of visits to writers’ clubs and creative-writing classes had left me with dozens of minilectures stored away in my head. I found the memoir minilecture and started it rolling. Elena was silent for a minute. “You could help me,” she finally said. It was a generous offer. Sharing anything with me seemed hard for Elena these days. But—did I hold it against my daughter that my own writing was going so badly? If I did, I disguised it well, even from myself. But I didn’t consider the idea—not even for a second. “You know I’m not a memoir person,” I pointed out. “That’s your gift, not mine. My writing mind works best when it’s escaping to a world I can make up.” And I thought of what a writer friend of mine said whenever someone hit him up with a book idea at a party: Thanks, but there’s another book I’d rather write. “But I don’t have any time,” she pointed out. I thought of Martin’s Word file, waiting at home. Neither do I! I thought. In spite of what you seem to think, neither do I. That night, as I lay in bed, I thought again about Elena and her memoir. It was touching that she thought of my writing skills with such faith. It had made me happy to be asked. But—write about the Summer from Hell? Me? There’s another book I’d rather write! Martin’s sullen face intruded into this reverie. Or maybe not, he pointed out, considering how little writing you’re actually doing. Poor Martin! I told him in an agony of guilt. Don’t give up on me! As I lay there, guilty and unhappy, a vision floated up in my memory of a glorious day back from the time when the girls were still at boarding school. Back then, I had a bad cold that had deepened into a sinus infection. I was feverish and thoroughly miserable. But the scene I had been working on the night before was boiling away in my brain. Eventually, on that glorious day, I couldn’t contain myself any longer. I had to get out of bed. I pulled on my bathrobe, made some tea to soothe my aching throat, and shuffled upstairs to the garret room and my computer. Marak’s goblins were meeting a traditional band of elves for the very first time—which meant that I, too, was meeting them for the first time. What did they look like? How were they dressed? What did my goblins think of them? What were these newcomers thinking of the goblins? That day, I was nowhere, and I was everywhere. I hid behind trees, and I looked into the minds of strangers. I didn’t feel aches and pains. I didn’t even exist. Not a sound or a worry interrupted my concentration. The girls were still happy at school. Joe was working late. Our old dog and cat were sleeping like the dead. After a while, an annoying little problem began to tug at me. Misspellings were starting to appear on the computer screen. My fingers weren’t finding the right spot on the keyboard. And why couldn’t I see my hands? I pushed my chair back and looked around. Night had fallen while I’d been working. I had been with my goblins and elves for ten straight hours! I didn’t feel like an author that day—not at all. I wasn’t published yet, and I couldn’t have cared less about genres or markets. All that mattered was that I had gone somewhere amazing and had seen things no one else in the world had seen. My house was a mess, and dinner came out of a box, but I was wildly, exuberantly happy. And that night, the night after that glorious day, as I went shuffling off to find the cough syrup, I couldn’t wait to wake up and do it all over again. Now, as I lay in bed and agonized over Martin’s stalled story, I recalled that day with wistful disbelief. My house was tidy, but my imagination was a total wreck. I was extremely lucky if I could forget my nagging fears and worries for as long as twenty minutes. And even when I did manage to forget for a little while, I seemed to interrupt myself on purpose. It was as if falling into my other world had become a dangerous pastime. I would get close to it, just close enough to feel the gravitational pull, close enough to find myself start to light up with interest . . .
And then I would jump up and run away from the keyboard to go iron a shirt or defrost a chicken. Maybe if I were just writing something different. If I can’t bring myself to care about you, I told Martin sternly, then the reader won’t care about you, either. You always criticize me! Martin said. Nothing I ever do is good enough for you. Text copyright 2015 by Clare B. Dunkle; text courtesy of Chronicle Books. 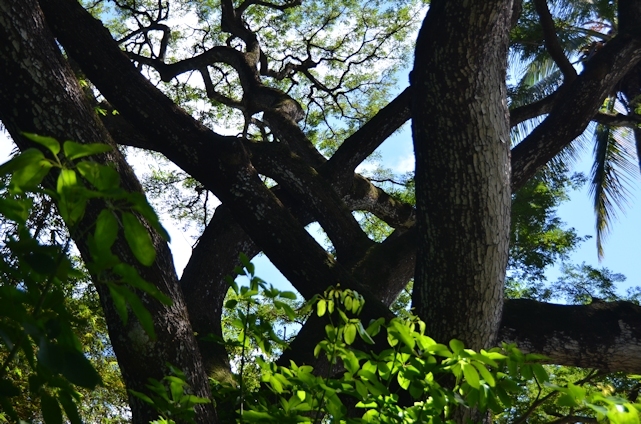 Photo of tangled tree limbs in the National Tropical Botanical Garden, Poipu, Kauai, copyright 2016 by Joseph Dunkle. To read my latest blog posts, please click on the “Green and Pleasant Land” logo at the top of this page. The stress of dealing with my daughters’ acute mental illness exhausted my emotional energy and seemed to damage my imagination. Eventually, this led to crippling writer’s block. We see it coming on in the following two excerpts, starting on pages 226 and 240. They describe my attempts to write The Walls Have Eyes, which was a sequel to The Sky Inside. That afternoon, I drove Elena to the high school so she could attend senior-class orientation. I was supposed to be working on a sequel to the book about Martin and his computerized dog, but for weeks, I’d done no writing because of all the hospital time. Now I was playing soccer mom. Poor Martin! I thought while I sat in the car, and in my mind, I could see him standing there, waiting for me to join him on an adventure. His scowl was a good match for Elena’s hostile expression. Thirteen-year-old boys don’t like to wait. I’m coming, Martin! I promised in a rush of guilt. Next week, I promise! As the months rolled by, our days fell into a very unhealthy pattern. Dead tired, Elena dragged herself out of bed and outlined a day with far too many commitments. If I tried to persuade her to slow down or skip something, she chewed me out. For everyone else, she had a smile or a laugh—even for her father. Only to me did she show her constant exhaustion, misery, and bitterness. I am the stepping-stone she pushes off to keep from getting stuck in the mud, I thought. Her anger toward me keeps her going. But it brought me almost to a standstill. Martin’s new story wasn’t going well. I didn’t know why. I was fond of him and his bright, affectionate dog, and I liked the colorful, dangerous world he lived in. But I couldn’t keep up with Martin on his adventures anymore. He would take off to go do something, and I would be left behind, asking myself, Why did he do that? Where did he go? Do I even know Martin anymore? But this story was already sold. We already had the money in savings. I couldn’t back out on it now. Guilt and worry started to needle me. I began to set word counts. Never before had I needed to force myself to write. But the next day, when I read what I had written, half of it would turn out to be garbage. I could tell that I’d written it only to fill up the word count. So I began to set a timer: twenty minutes to start with. Any more than that, and I couldn’t stay focused. Maybe it’s Alzheimer’s, I thought. Maybe it’s incipient dementia. Martin’s world is hazy now, and I can’t figure out what he’s doing. I can barely even spell anymore! Finished with my game, I would check the tea temperature. Was it too cold? I would get up and warm it in the microwave. Then I would have to check my email again. Then the news sites, one—two—three. Sometimes, this ritual ate up the whole twenty minutes. Even when I did manage to get some pages done, it didn’t seem to matter. “Do you want to read what I wrote today?” I asked at dinner. But, as it turned out, nobody did. But I didn’t want Joe to read it at lunch. I wanted him to read it here, right in front of me, the way he used to do, while I peeked over his shoulder and read it along with him. I didn’t want to send my story off in an email. I wanted to share it. But it did matter. It mattered a great deal. The next time I sat down and opened my laptop, poor Martin wouldn’t get anything done. Why go on a journey, he would tell me, if nobody cares what I do? They’ll kill you if they catch you, I would remind him. I’m dead anyway. Who cares? At which point, I would notice that my tea had gotten cold. I would get up and reheat it. And then I would check my email. And the news sites. The short excerpt below comes from page 205. An earlier excerpt has already brought up the fact that my characters sometimes help me understand things about the real world. This one shows how I sometimes put a character between me and the real world and react to the character rather than to reality. I suspect this is a defense strategy. Also, I remember a writer—I think it was T.R. Pearson—talking once about how we writers understand our characters better than we understand real people. That makes a lot of sense to me. When I realized that my daughter had to stay locked up in a mental institution where she very likely didn’t belong, what I felt was beyond horror. To know that my beloved child, who trusted me, was being held prisoner and that it was my signature on a form that had put her there . . .
My imagination immediately dredged up all the most ghastly images that anxiety and guilt could conjure and played them all for me in one long, gruesome ordeal. Outside was a honey-colored sunset and the long, inconspicuous process of twilight, but none of the mundane things I saw around me seemed to match what I was going through in my head. It was as if I were watching a movie about my hotel room while actually being somewhere else, somewhere very dark and scary that I couldn’t escape. And in that dark, scary place was this movie of a lit-up hotel room, playing on a little computer monitor in the corner. Gray dusk congealed into black night. All the lights were on in that little hotel room on the monitor. But they couldn’t light up the dark, scary place I was in. It isn’t that I stopped thinking. If anything, my thoughts spun too quickly. I was worrying, and I was regretting, but strangely enough, I wasn’t thinking about Elena. All I could think of was Kate, my Jane Austen girl from Marak’s goblin kingdom. She ended up locked in the caves underground, and for a very long time, she hated it there. She would go to the doors and argue and beg to be let out. Now, as I staggered around in that dark, scary place, I could hardly bear to think of what I had made Kate suffer. How could I do that? I thought. How could I have been so cruel? And I found myself obsessing over how I could reach her—how I could apologize to my character for what I had put her through. Text copyright 2015 by Clare B. Dunkle; text courtesy of Chronicle Books. 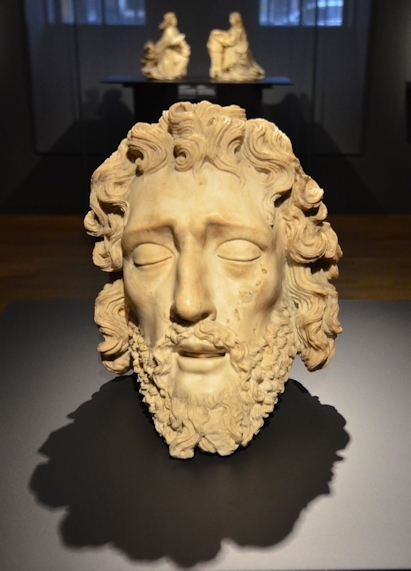 Photo of an alabaster head of John the Baptist in the Rijksmuseum, Amsterdam, the Netherlands, copyright 2014 by Joseph Dunkle. To read my latest blog posts, please click on the “Green and Pleasant Land” logo at the top of this page. The excerpt below, from page 181, is a follow-on to yesterday’s excerpt. Noticing how gloomy I felt, Elena suggested that I see the hospital social worker. So I did. It wasn’t long before the social worker struck a nerve. She described my fiction-writing as dissociation. This is a psychiatric term for the disconnection of our mental state from our surroundings, and it can range from mild detachment while waiting for something boring to be over (such as daydreaming while waiting in a doctor’s office) to a complete shutdown into unconsciousness when challenged by trauma or the memories of trauma. At the time, I was particularly upset by the social worker’s comment because Elena was dissociating in a severe way. She had spent days unconscious and disconnected from reality. Was the social worker right that fiction-writing is dissociation? Not in the sense that daydreaming is. It’s true that story creation pulls me away from the real world, but then again, so does any intense mental activity that demands all my attention, such as dedicated research, careful reading, or even nonfiction writing. And story creation helps me work through problems I’m struggling with in the real world, rather than helping me escape them. The comparison of fiction-writing to daydreaming is understandable but unfortunate. Daydreaming is wish fulfillment, and we’ve all done it from time to time, but it has none of the intricacies of story creation. The first thing I start to do when I create is ask questions about the new world I’m seeing, and I have to find consistent, realistic answers to those questions. But nobody asks questions of a daydream. Daydreams don’t need to follow consistent world rules. My reaction to the social worker wasn’t just colored by my negative feelings about dissociation, however. It was also colored by something every fiction writer goes through: a very common reaction to the word fiction. When the subject of what I do for a living comes up, a sizable percentage of people go out of their way to impress upon me just how trivial they believe fiction is. “I don’t read fiction,” many of them immediately say, and then they go on to observe that fiction is more or less a toy to entertain children. In fact, a certain number of them make a point to say at once, “I never read books,” or “I don’t have a single book in my home,” as if books themselves are toys. This has always struck me as bizarre. Do these same people, upon finding out they’re talking to a chef, say, “I hate fussy meals”? Do they make a point, upon meeting a doctor, to say, “I hate getting checkups”? I suppose they probably do. But why? That’s what I’ve never understood. I felt taken aback. I tried to be reasonable and evaluate the questions fairly, but then again—they just didn’t make sense. Obviously not, I thought to myself. Why was that? Ask the small child sitting quietly in a corner of the room, working on her dot-to-dot puzzles. Ask Heathcliff. Ask Sara Crewe. Ask Florence Nightingale. Laughter is always appropriate. A wry comment and a quiet chuckle are welcome even beside the grave. But crying is a special dispensation extended to widows and babies. Me, I needed to be doing and planning—not crying. “Elena doesn’t need that,” I said finally. “She’s going through enough. And besides—well, we’re in public here!” And I tried to imagine myself breaking down in a busy waiting room. Nope. My imagination could picture monsters, but it couldn’t see this. I didn’t answer. Inwardly, I thought, Why would that matter? This is my code of conduct, not someone else’s. But how could I explain it? Why did I even need to explain it? Why couldn’t this woman just leave it alone? I had to pause for a minute. But I found my stiff upper lip. The social worker frowned. “You need to be able to cry,” she said. What happened to not judging me or bothering me? And the thought of the insurance company acted on my torn and injured feelings like a cool menthol lozenge on a sore throat. It helped me breathe. It laid soothing coats of logic and procedure over the burning pain inside me. The social worker seemed to sense my change in mood. At my growing calm, she grew sterner than ever. “Well, yes,” I admitted, and the thought of my characters completed the job of helping me re-center. It’s not fair to Paul and Maddie to say that they’re not real, I thought. They’re as real as anything else about me. Their love is certainly just as real, that true adolescent first love that makes the whole humdrum world we grew up with somehow look different overnight. And at the thought of those two shy, serious lovers, a little glow of happiness warmed me. Did this woman have the foggiest idea what dissociation really looked like? Had she ever wandered, lonely and miserable, through a chaotic, paper-piled house while every single person in the world found other things to do? Had she ever sat next to the phone, hour after hour, single-mindedly willing it to ring, while the adults who had been closer than family—closer than family!—stepped away and closed off? Just stopped caring? That was dissociation: it was pulling away from risk to safety—just flipping off the switch that says I care. And me, I had actually lived through the hell that happens when adults do that to a child. Is that what this woman actually thought my books were—just a spa where I hid to escape my obligations? Is that what she actually thought fiction was—nothing but a pretty little playground? God, how I despise those people who put on their long “I’m a grown-up now” faces and sit in judgment of the value of fiction! They keep themselves safe inside their rigid little closed minds and live out their rigid little lives. And if anything that they don’t understand comes along, they shrill out their little judgments, and they attack it. Dissociating into my books! . . . I took a deep breath. Logic and reason—I needed logic, and I needed reason! I needed to think this through. Why would she attack me? Here was a thought: maybe it had been a bold gambit to try to shock me into tears. Well, it was going to take a whole lot more than that. And that was the end of my talk with the social worker. Text copyright 2015 by Clare B. Dunkle; text courtesy of Chronicle Books. 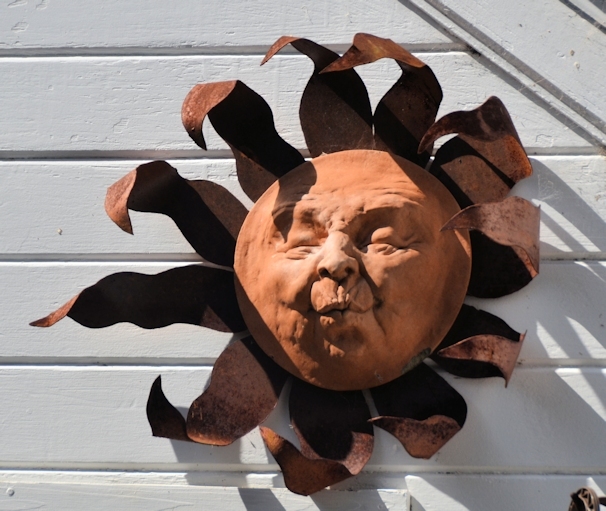 Photo of a sun sculpture on the side of a house in Mendocino, California, copyright 2016 by Joseph Dunkle. To read my latest blog posts, please click on the “Green and Pleasant Land” logo at the top of this page. This excerpt, which begins on page 177, deals with the effect of mood on the imagination, a frequent issue in a book with as many emotional shocks as this one. Mood has a huge impact on creativity. As I’ve stated elsewhere, the novel you write while depressed or emotionally exhausted will be a very different work from the one you write while you’re feeling healthy and upbeat. The results of the reader-mail project described below can still be seen on my website. Even now, my website is the hobby I turn to when I have a few weeks of leisure time. Elena and I didn’t have much space in that little hospital room, and I had long ago exhausted the fun of exploring the different public spaces in the building. I was homesick for Joe and my pets and our house in Germany. But at least I could go stretch my imagination in my various fantasy worlds. I had put together a complicated web project to occupy my time. I was moving the most interesting questions readers had asked me onto pages on my website. Thinking about those questions took me to new places. They were helping me stay calm and optimistic. I brought up my email and rummaged through stored messages, looking for interesting questions. Why does Paul carve Maddie as a tree? one reader had written. That seems like a weird thing to do. Paul and Maddie were characters in my Scottish werewolf book. It was such a sad, sweet love story that my heart melted as I read the question, and my bad mood vanished at once. I loved Maddie for her frank, open nature, and I loved my poor woodcarver, Paul, for the suffering he had lived through. Together, they were my favorite story couple. Maddie doesn’t care for it any more than you would, I wrote. She’s down-to-earth and has a very different view of herself than Paul has of her. And as I wrote, my imagination played for me a scene in the small, windowless sod house full of peat smoke. The wooden figure was different. 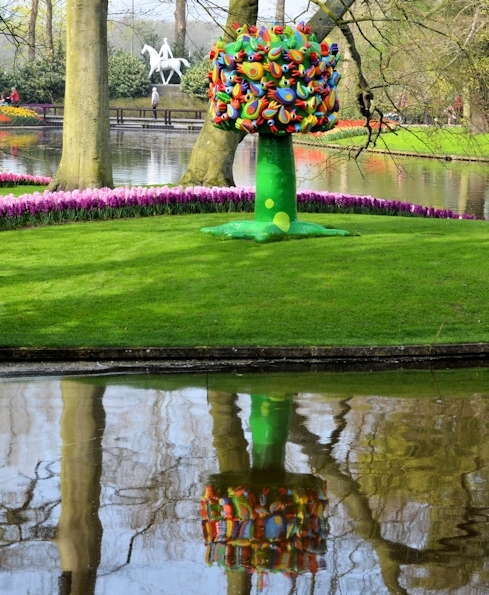 It still had a tree’s crown of leaves and apples, but the trunk had turned into a pale, slim girl. Leaves grew out of her hair, and her two arms stretched out to become branches. Maddie walked toward the doorway and turned the carving in the light, studying it with wonder. Maddie examined it. The tree girl was slender and sweet, poised and graceful. Maddie could see that she was happy by the lift of her arms and her chin. Happy to be an apple tree, happy to grow where she was planted. The tip of one toe-root just showed beneath her long skirt. Paul took the carving to look at it and then at her. She could tell that somehow he still saw the resemblance. “You’re beautiful, Madeleine,” he said. As I watched my two young characters, I felt again the love they had for one another—that magical first love that has such wonder in it. I’m glad I wrote their story, I thought. I’m glad I brought them to life. Maddie has such a generous heart, and Paul makes such a fascinating monster. The tone was so vehement that it stopped me cold. My hands froze on the keyboard. Elena had been calm and philosophical for so long now that I had forgotten she could still sound like this. “But . . . ,” I said. After all the time and all the hard words that had already gone by, I ought to be prepared for this sort of thing. But to run into such violent hostility between two of the people I loved best in the world . . . Without a word, I went back to my questions and answers. But the color had drained out of my day. How old are Paul and Maddie in the book? wrote another reader. Who cares? I thought. Paul and Maddie aren’t real. They aren’t real, and they don’t exist. Hopelessness welled up inside me. My family is broken, I thought. My family is irretrievably broken. I’m the mother, and I’ve let my children become damaged and ill. Two children in the hospital—not one, but two! Hatred and bitterness—how did it happen? What kind of mother would let that happen? Text copyright 2015 by Clare B. Dunkle; text courtesy of Chronicle Books. 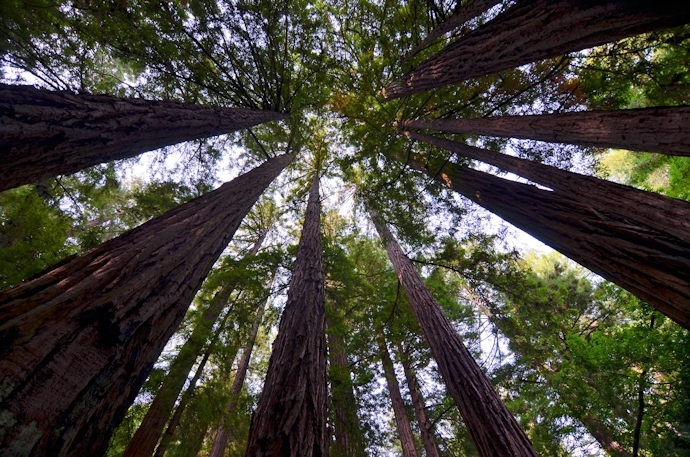 Photo of redwoods in the Muir Woods National Monument, California, copyright 2015 by Joseph Dunkle. To read my latest blog posts, please click on the “Green and Pleasant Land” logo at the top of this page. The episode below begins on page 159 and describes one of the worst nights of my life. Elena had just been medically evacuated from Germany to the United States. Her heart was very fragile. I had been staying with her in the ICU in Germany, where there was no bed for me, so I hadn’t slept in a couple of days. Elena’s new room in the United States was in a children’s hospital, and I had been thrilled to learn that there was a pullout bed in it for parents to use. We had just settled in, and I had taken out my contact lenses and lain down. (My vision is terrible without them.) Then Elena went into crisis. The staff raced her out of the room for tests and then raced her over to their ICU. I raced after them, almost drunk on sleep deprivation and barely able to see. None of us had any idea what was wrong. But that’s not why this excerpt is here. It’s here because of what happens at the end. I routinely spend time with my characters in my imagination as a way to distract myself and calm myself down; it gets my head out of my daily worries. But during this horrible night, my imagination didn’t work properly. My characters, for the first time in my life, simply didn’t live. I can’t express how bizarre this change felt. If my characters live in my books—if they seem like real people you could follow around—it’s because they’ve seemed real to me and I’ve followed them around for years. Before they come to life on the page, they’re alive in my mind. But not that night. For the first time, most of my characters were the puppets readers imagine them to be. This episode was a small taste of the severe writer’s block I developed later. That later writer’s block also came about as a response to a severe emotional shock. There is a relationship between good mental health and a properly working imagination. I don’t understand the technical aspects of it, but I’ve lived through what happens when good mental health goes away, and its effect on the imagination is devastating. I suppose Jung would say that my character Marak is a manifestation of my animus. I’m well aware that the ugly goblin King is an important part of who I am. Elena’s gurney stopped in a vast room without edges that I could see. A white shape detached itself from the vague scenery and approached me. Completely bewildered, I tried to process this unexpected information. My brain felt for the edges of this new obstacle, but nothing like a useful idea came back. I couldn’t stay here: a big blank wall that my thoughts couldn’t get past. Dead end. It was a dead end. I was at the end. “There are waiting rooms and sleeping lounges,” answered the shape. Then it walked away. I was standing beside the gurney. The only thing my poor eyesight could decode was the still form lying on it. Only my sleeping daughter had a face, half bad vision and half good memory: that face I had known and had watched for every quicksilver change of mood—for how many years now? That face was the only familiar thing left in my scary world. I leaned in, close enough to see the face clearly. My sparkly daughter. My youngest child. But the face didn’t move. It didn’t respond. I didn’t think I could bear it. My heart was going to break. My daughter didn’t stir. She was breathing quietly, frowning slightly: still, remote, and utterly impassive. I couldn’t help myself. I started to cry. Elena’s eyes didn’t open. But she rolled over, like a sleeper who has been disturbed. One thin hand reached up to touch my face. Then the white shape was back. “You need to leave now,” it said. I blundered out into deserted hallways, where featureless black night pressed up against the windows. Somewhere in this building was a foam bed with sheets on it, all made up for me, but I had no idea where that foam bed was. It didn’t occur to me, in my sleep-deprived state, that I could go back to that room and that they would let me sleep there, even though Elena was somewhere else. It didn’t occur to me that I could go to the front desk and ask for my daughter’s room number. I was beyond such practical thoughts. So, once again, I wandered hospital halls, as I had done on the night Elena was born. I met no one. I recognized nothing. Nothing disturbed the misery of that journey. Dark glass windows lined the wall to my left. Night. I glanced outside. But I wasn’t looking outside, I was looking inside, into an unlit room. My bad eyes could just make out rows of foam chairs like the one in Elena’s room by the window. This is a sleeping lounge. It’s here for people like me. I found the door and tiptoed inside. One other person was using the room. A man lay cocooned under a dark blue blanket nearby, on a foldout chair of his own. He had the blanket pulled up over his face. I tiptoed past him, found stacks of those same blue blankets near the wall, and located a pile of pillows as well. I took a set, tiptoed to a chair that seemed a suitable distance away from the sleeping stranger, and arranged myself for the rest of the night. My waistband pinched. I hadn’t taken off my shoes. But I couldn’t do anything about that now. I had gone as far as I could. I rolled onto my side, hugged my purse like a teddy bear, and closed my eyes. No one was there for me—not my family and not the collection of kind staff members I had left back in Elena’s hospital room. That hospital room now seemed like a star hovering in the dark sky nearby, and it formed a constellation with the other star, the room without edges that held Elena’s motionless body. I felt those stars, not intellectually, but viscerally, as points of reference toward which I could navigate. But my exhausted brain and body both agreed: I had no strength to reach them. Not anymore. Those stars were sealed off from me. I would find no comfort there. So, in a last blind, muddled attempt to shield myself from bone-shaking loneliness, I reached into my mind, toward the characters who had been my friends and companions over the years. But even my characters wouldn’t meet me halfway. They stood around the walls of the pale gallery of my imagination, half wax doll and half astonished, so influenced by my own state of shock that for the first time, they had no life in them. Only Marak, the old, ugly goblin King, the oldest of my character children, still had the strength to come to my rescue. Only Marak, that brilliant, pitiless schemer, still had a mind of his own. He assessed me through his tangle of rough, striped hair, slightly amused and a little worried and very, very wise. Then he came and lay down beside me and wrapped his strong, bony arms around me, and I could feel his hands with their knotted fingers clasping my own hands as they clasped my purse. I’m safe now, I thought with more optimism than logic. Marak will protect me. He’ll do the planning for me. That brilliant mind is never without a plan for long. I closed my eyes and sank without a trace into the dark, sad, featureless night. Text copyright 2015 by Clare B. Dunkle; text courtesy of Chronicle Books. 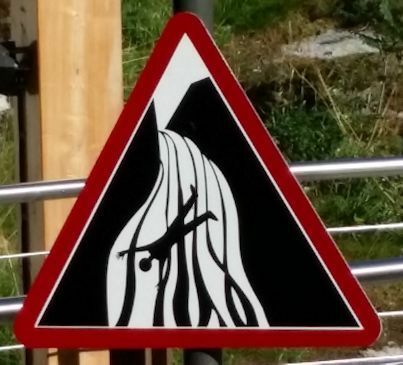 Photo of a warning sign in Norway copyright 2014 by Joseph Dunkle. To read my latest blog posts, please click on the “Green and Pleasant Land” logo at the top of this page. The picture above combines two images. 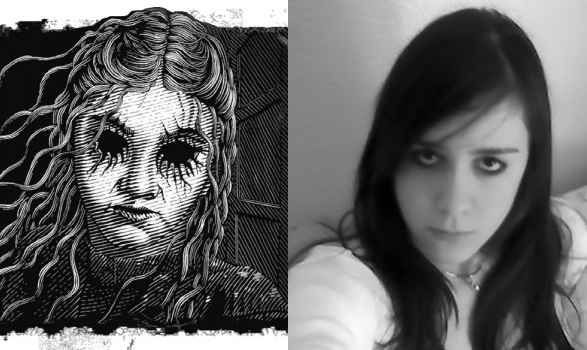 On the left is an illustration of the ghost, Izzy, from The House of Dead Maids, the novel I wrote to mourn my runaway daughter Valerie. On the right is a photo of Valerie herself, not long before she vanished from my life. The comparison is eerie, isn’t it? But Patrick Arrasmith, the amazing illustrator, had never seen my daughter. He created his image from my descriptions in the book. Patrick Arrasmith seems to have read my mind—because deep in the back of my mind, Izzy was Valerie. The moment when Izzy first appears was, for me, the most important moment of that writing experience. That moment was the whole reason my mind made up the story in the first place. It allowed my missing daughter to stand before me and judge me for all the things I’d done wrong in her life. It gave her a chance to warn me: We’re not so different, you and I. But I didn’t know any of that while I was writing The House of Dead Maids. I only knew that I had to write it. Only later, when I reread what I’d written, did I realize that images of Izzy and images of Valerie were interchangeable in my mind. That’s when I finally understood. I’ve highlighted in previous excerpts from my memoir the various ways in which my real life and my imaginary life run in parallel. The emotions of my real life bleed into my imaginary life, and my imaginary life becomes a kind of three-dimensional Jungian puzzle in which my psyche attempts to work out the problems I’m facing, such as my runaway daughter accusing me over my failures as a mother. I’ve also highlighted some ways in which my real life and my imaginary life intersect. Distractions don’t just break my attention. They actually intrude into the “film” I’m watching and cause things to appear that don’t belong in the story. That’s because my brain, always thinking in pictures, shows me pictures of distractions, too, until the interior of my mind becomes a cluttered flea market of disconnected items. This excerpt, which begins on page 109, brings all of these ideas together. Better than any other episode in the memoir, it illustrates the weird dance that takes place, minute by minute, between my real and imaginary worlds. The next afternoon, I was sitting in the very same spot, curled up in one of the big, overstuffed brown chairs with my laptop open on my lap. But, although sunshine flooded the garden room with light, I was seeing another place entirely. It started between my ears, at the top of my head, and slowly grew outward, increasing in size and color until the world in front of me blurred out. Then, although I was still dimly aware of Tor twitching his paws in his sleep, that other place was all I saw. Rough stone walls had risen out of my mind and obliterated the sunlight. I was looking down a gloomy hallway in a bleak, dismal old house, half castle and half barn. The scent of stale air rose from dank, unopened places. It made me want to hold my breath. Shadows congregated in this dim hallway, and dust, and cobwebs, until I found myself squinting to see. As my eyes adjusted to the gloom, I could make out a figure standing in the shadows: a gray-faced girl in a ragged black dress. This girl had been the very first of all this story’s ghosts. Her life had ended long before she came into my world. Everything that had made her human had fallen away. She had lost her fears and her joys. She had lost her eyes. This poor little once-upon-a-time human had never shocked me, not even the very first time I saw her. But, no matter how many times I studied the empty black circles in her gray face, I never stopped feeling sad. At the moment, I was rereading her grim story with great care, matching the image the words raised in my mind with the image the way it had looked when I had first dreamed it. If the words were wrong, they would form a fuzzy double exposure, and the image and the feelings it raised wouldn’t come into focus. But if the words were right, I could read the story just the way my readers would, and I would see exactly what I was supposed to see. Then my mind wouldn’t have to work to bring the image to life. The words would do it for me. She stood very still in the dusky passage where the light was poorest. Like me, she wore the black dress that proclaimed her a maid of the house, but where mine was new, hers was spoiled by mildew and smears of clay. Thin hair, dripping with muddy water, fell to her shoulders in limp, stringy ropes. This was my companion of the night before—and she was dead. I could see it all: the long, limp, wet hair and the mildew-spotted black dress. But wait a minute—was that right? Mildew was black, wasn’t it? Could mildew be white? Or was it always black? Could mildew show up on a black dress? Probably. Possibly. I didn’t know. And I didn’t want to wait for a copyeditor to ask. I clicked away from the Word file I was reading, pulled up Google, and typed mildew into the search box. The phone rang: a double interruption. The eyeless ghost flickered and grew faint. I grabbed the phone with my free hand as I scrolled through the Google results, willing the ghost to stay where she was. “Hello,” I said, scanning. This stuff was all about mildew in houses. But there, at least the Wikipedia article mentioned clothing. Dr. Petras? Right, the child psychiatrist with the silly, droopy mustache. I had dropped Elena off at the hospital two hours ago, and she had intended to walk upstairs to her appointment after she did some volunteering. He must be calling to confirm that she wouldn’t be coming back to see him. Maybe he needed to talk about her prescription. Did Elena still need that Zoloft? Her feelings about Valerie weren’t as raw now as they’d been a few months ago. At the thought of Valerie, the eyeless ghost standing in front of me changed. Now my absent daughter stood in her place. Long hair, pale oval face, black eye shadow, ragged black clothes. The impression in my mind—the wistful sadness—remained the same. But it’s getting better, I reminded her. You sent me an email just yesterday. You’re crazy about Clint, your new boyfriend, you told me. You wrote to say that you love me. Meanwhile, in my ear, Dr. Petras had charged ahead. His voice was stern, like a reprimand from the boss. After listening for a few seconds, I realized that I wasn’t sure what he was talking about. Ghost in the room, ghost in the Word file, ghost in my family circle—I couldn’t break free from it all quickly enough for him. The shadow of the lost Valerie slipped away like a raindrop. Headlines lit up in my mind. Somewhere in there was Karen Carpenter’s strong, expressive voice, half laughing, half crying, saying she had the blues. But . . . she’s the one who’s completely normal! I thought. Was that anorexia? What was anorexia? Wasn’t Elena normal? Dr. Petras had taken off again while I was caught up in my own confused thoughts. His tone was hard—almost rude. More than the words, the tone captivated me now. What could it mean? Because it was okay, wasn’t it? Wasn’t it always good to put the right words to something? If they were the right words, that is—and the skinny-horse woman loomed in front of me again. But that didn’t make sense. Elena didn’t look a thing like that horse and that woman. She had an adorable figure. For heaven’s sake, her bras were a bigger cup size than mine! “This is very serious!” Dr. Petras said in answer. He sounded as if I was confirming his worst suspicions. Was Elena all right? Had something happened? Anxiety surged through me, the anxiety that I had lived with every day—every minute!—for a solid year. The anxiety that was just now—just these last few weeks—beginning to go away. And the gray-faced ghost that was really my missing daughter drifted back into the room. She stared at me mutely. Accusingly. Muscles tightened in the back of my neck and sent fingers of tension crawling down to my shoulder blades—the tension that I had once thought would never let me go, the tension that had just started to release—just a little. And the warm, drowsy room, the blissfully unconscious cats, the almost-finished manuscript—the entire day, in fact, began to wobble in my grasp. And the sunny day smashed into pieces. Text copyright 2015 by Clare B. Dunkle; text courtesy of Chronicle Books. Illustration from The House of Dead Maids copyright 2009 by Patrick Arrasmith. Illustration courtesy of Henry Holt & Co. Photo of Valerie copyright 2005 by Valerie Dunkle. 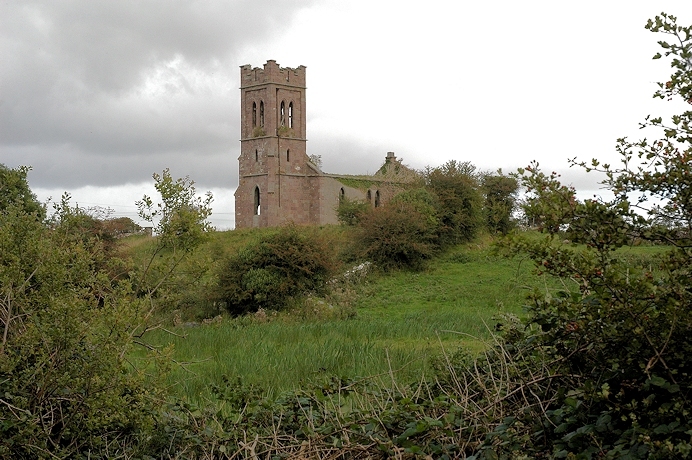 To read my latest blog posts, please click on the “Green and Pleasant Land” logo at the top of this page.